I noticed that some of the information on the front page of this thread needs to be updated. On the Announcement Page under the "Mintcoin: Year 1 Minting Statistics"... a lot of that is outdated now. Do you think we should put up more relevant info? ~Price change in last 365 days: +54% in $USD. Tubularwindow thanks for creating the countdown and pointing out that coolbeans data should be added to op. Faucet also updated. Happy Independence Day. Keep on minting my friends! It's strange how unlike with mining, a reward halving for minting can be so unpredictable. The new supply will be lower, but buying coins to mint will be less effective and thus will be in less demand. Any news on solving the blockchain bloat problem that affects all cryptos eventually? I know that some of you Mint guys are at the forefront in finding a solution. I actually have been working on some code to take care of this. Haven't put a lot of time into it lately though, I don't have much incentive too, but I would guess I am 75% of the way to a beta version of the code. From my understanding, the current minting is 5%, right ? How will it be after halving? Really half the current % ? buying coins to mint will be less effective and thus will be in less demand. I actually have been working on some code to take care of this. Nice to see presstab in the mint thread again. Current is 10%. Moving to 5% next halving. Is there a way this incentive can be brought back? Well my own coin, HyperStake is around block 700k, so bloat will come in the mid-term for that and would incentivize me. I have paid projects I am working on on the side, so they take priority over projects that are just sort of for fun. are there any bountys for translations? 1 - A way to spend Mintcoin - dice games are a good step in any crptocurrency development. 3 - Mintcoin wins visibility, It will be displayed in our website next to btc or ltc. Also our site have faucet for any of the altcoins accepted. 4 - Affiliates earn coins in the original bet currency, so users that don't know about Mintcoin may find they have some balance of this currency because their referrals's earnings and start to learn about Mintcoin. Hi. I don't think it is really that much, if any, different than mining. In fact, in all cases I consider it better than mining. With mining, eventually your equipment wears out, with Mintcoins, they don't wear out. If you think about the Mintcoins themselves as being your mining gear (or minting gear, rather)...they are just as good and effective a year ago as today. When the rate goes down to 5%, the supply will rise slower, but that does not change the effectiveness of minting coins. The only thing that changes is minters will get less coins, but the effectiveness of the minting process doesn't change. Since the value of each coin you mint is a function of the price per coin, then, supply going down and demand being constant, price should eventually begin to rise to offset the reward drop. As a result, instead of the mintcoin market generating 6 million coins per day at say $0.00007 each, = $420 value per day........ once equilibrium is reached, the price should rise to offset that.........say 3 million coins per day at $0.000140 each = $420 value per day, so the value of what you are minting stays the same. But keep in mind that the price change will probably not happen overnight. If the price doubles, that also means the value of all prior mined and minted coins double in value too! So what you can save away today, could pay off even more later. But there will be probably be profit takers along the way up too, so finding equilibrium could take a while....but it might not...there are a lot of other factors to consider such as, that the mintcoin market cap is relatively small compared to a coin like bitcoin so bigger moves can happen quickly, and for no apparent reason. So true value (coins generated x price) shouldn't change. But that doesn't mean it won't change. Some people are attracted to high reward annual percentage rate (APR), others are attracted to prices moving up. I believe Mintcoin intends to find a balance of both worlds. Too high of a APR, and too many coins flood the market, causing price depression and instability, and nobody will want to hold the coins unless they are able to be staking/minting their coins, but not everyone can or will do this. Who wants to stake a worthless coin? And it is probably not fair to those who aren't interested in computers and minting, if they just want to collect a few coins but not stake/mint them, then their value of their coins will be devalued quickly over time. So we need less coins being added to the supply, to help keep prices up. But on the other-hand, too low of a APR is not good either, as it could create fungibility problems with too few coins in circulation to be of any use for trade, and too low of a rate, nobody will bother even staking/minting to securing the network, which is very important, or you don't have a coin at all! So I believe Mintcoin will have the good balance of both worlds and that the prices should continue to steadily rise, and at 5% in a year, the minting is rewarding enough for those who put in the effort to do it, but not so high as to be unfair for people who don't mint/stake. We want our coins to hold value for all people, not just stakers/minters. Hopefully this will help create demand for MINT from all types of people. This is the challenge of trying to make a perfect coin that pleases everybody, but I believe MINT comes pretty close. Quick chart - Weekly view. I'm expecting a breakout of the trendline (white dashed line) with 42/47 sat as target. I was not aware that TradingView had any Mintcoin charts... Thank you for bringing this to my attention. What is the max supply cap of mintcoin? Initially the max coins were around 70 billion during the POW phase. However, due to the nature of POS, the max coins will always be based on the minting reward which keeps the network running. Currently the minting rate is up to 10% of outstanding coins but will be up to 5% soon. What is the development status for MINT? Does Mintcoin still have developers working on keeping it updated and improving it? As an investor, I would be interested to know how things are going. I think this coin is excellent and want to see it thrive. Yes development is still active, albeit slow going. Time constraints and real-life/family obligations amongst the team slow things down more than we would like, but such things are inevitable. We have reached a turning point (and a roadblock) with the 2.1 overhaul and are currently exploring multiple options to proceed. We cannot give any kind of ETA at the moment, but we are planning on releasing a more detailed and in-depth statement regarding the update when our current hurdles are overcome. Keep up the good work! The most important thing is long term dedication and not giving up. Steady plodding and diligence in your business does bring prosperity. I like to think of Mintcoin sort of like our business. We all have different abilities like trading, coding, marketing, teaching/educating, investing capital, etc. And we all need each other because to do all of it would be too much for 1 person. 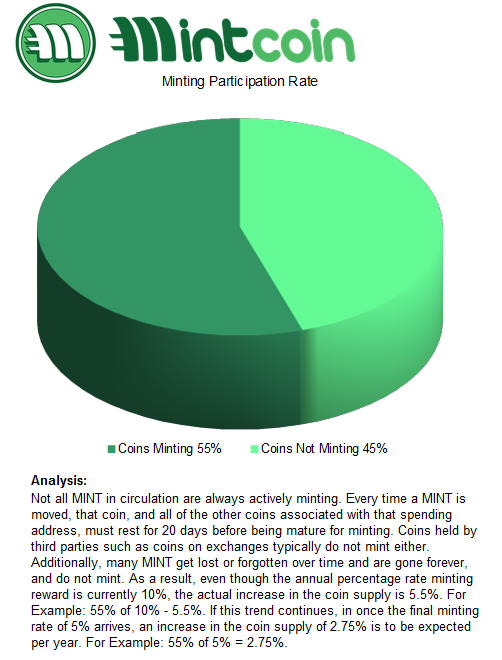 But I am and probably a lot of us here are planning to be with Mintcoin for the long run. I would even eventually like to pass on the gift of Mintcoin to future generations. Keep on Minting friends! Hey btw, does anyone know if the Bitcoin halving has happened yet?